Vince Vaughn (Couples Retreat) and Owen Wilson (Hall Pass) explore the age gap in The Internship. Vaughn’s Billy McMahon and Wilson’s Nick Campbell are salesmen whose careers are torpedoed by the digital age. In an if-you-can’t-beat-’em, join-’em move, Billy and Nick win spots in a coveted internship with Google. But then they must compete with a group of young, tech-savvy geniuses for a chance at employment. Vaughn came up with the story and co-wrote the screenplay with Jared Stern (Mr. Popper’s Penguins), with Shawn Levy (Real Steel) directing. The film also stars Rose Byrne (Bridesmaids), Aasif Mandvi (Premium Rush), Max Minghella (The Social Network) and Rob Riggle (21 Jump Street). The Internship grossed $44.6 million in theaters, about on par with Vaughn’s recent films, including The Watch at $35 million and The Dilemma at $48 million. 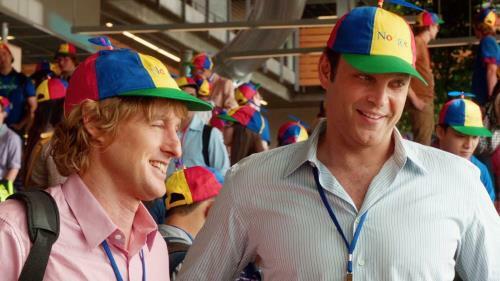 Critics like The Internship better than those earlier comedies, but not by much. The film earned 35% approval, according to Rotten Tomatoes, but moviegoers rated it higher at 63%. and an audio commentary with director Shawn Levy on the theatrical and unrated versions. The Blu-ray adds deleted scenes.